Jimmy Negron, Puerto Rico´s renowned beauty expert, is coming to Orlando this summer for the Me Barbers Workshop by Mildred Emmanuelli Hair and Make Up Designers. Only two special dates are available, unique chances to experience an incredible opportunity to learn from the Master Beautician, Cosmetologist and Barber. Create this season’s hottest men’s styles, cuts and trends! Designed to inspire, elevate and deliver, this hands-on session invites you to learn and build your creativity. Worldwide experience meets Latin flavor as Jimmy brings his personal philosophy, taking you on a journey thru several continental techniques in order to obtain the most impressive results in each area. Let yourself Be Inspired by hottest trends in the Barber industry – relevant techniques you can take back and apply in your barber Chair. Investing in training is one of the best things you can do in order to rise above the competition. There are few opportunities to experience first hand these contemporary techniques that are rocking the entire world as you read this, but will also inspire trends for at least 10 more years. Taking advantage of more than two decades of knowledge and expertise in the beauty area is a chance few people in Florida are going to get this year with the ME Barbers Workshops. And this translates in more credibility, more impressed customers and a trend setting style of your own that’ll boost your business to a level you’ve only dreamed of. It’s the chance of a decade to train with one of the most recognized and talented experts in the world. Don’t miss it. 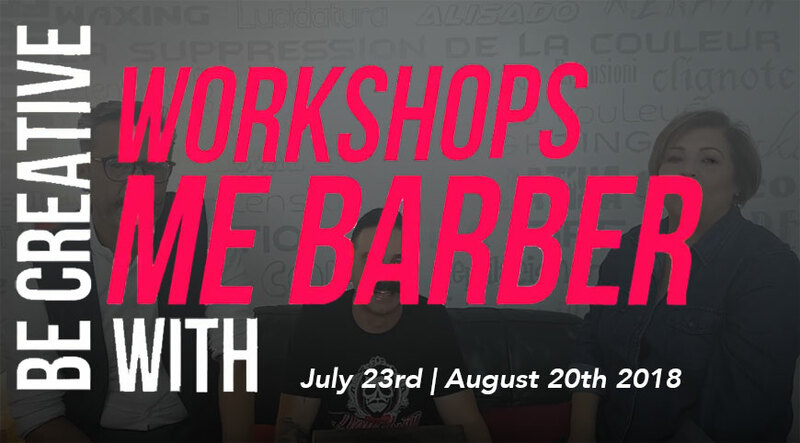 This years´s ME Barbers program includes 1 day of full theory so you´ll get up to speed. After that, it’s a hands-on training to let yourself get immersed on Jimmy´s techniques and totally experience them as you master each one with your very own hands. You´ll also have mannequins & training materials for reference during training – and of course something that we all love: coffee & lunch. Plus, you´ll get the chance to win unique prizes at the raffles that´ll take place during both days. For the past 20 years Jimmy Negron has been the leading coach of Puerto Rico´s international beauty team, boasting an incredible expertise alongside world class names like Vidal Sassoon, Paul Mitchell, Ichiro Tanaka (Japan´s national champion), Mario Pichinino (Italy´s national champion), Raphael Perrier (France´s national champion), Salvador Fodera (USA´s national champion) and several other names from Argentina and Germany. Originally from Puerto Rico, Jimmy has evolved the Men’s fashion runways, photo shoots, scores of events and on the heads of international Barber shows and Expositions. He is also known for being an international coach for cosmetic companies and their development teams – like Brazil´s Ecosmetic and Colombia´s Anien. One of the many responsibilities Jimmy has is training beauty teams from Uruguay, Palestine and Brazil each year, as well as having trained the Chinese team back in 2012 for the Asian Championship – where they obtained both cups and rocked the entire continent. His next challenge: The OMC 2018 Championship that will take place in France.